July 28, 2016, 11:18 a.m.
During last week’s Trident debate in the House of Commons, new Prime Minister Theresa May was asked whether she was "personally prepared to authorise a nuclear strike that could kill 100,000 innocent men, women and children." May’s answer was an unequivocal "yes," arguing that the whole point of having a nuclear deterrent was displaying a willingness to use it. In this she was contrasting herself to Jeremy Corbyn, who has previously said that he would never launch a nuclear strike. Having control of a country&apos;s nuclear weapons is arguably the most solemn responsibility any Prime Minister has. 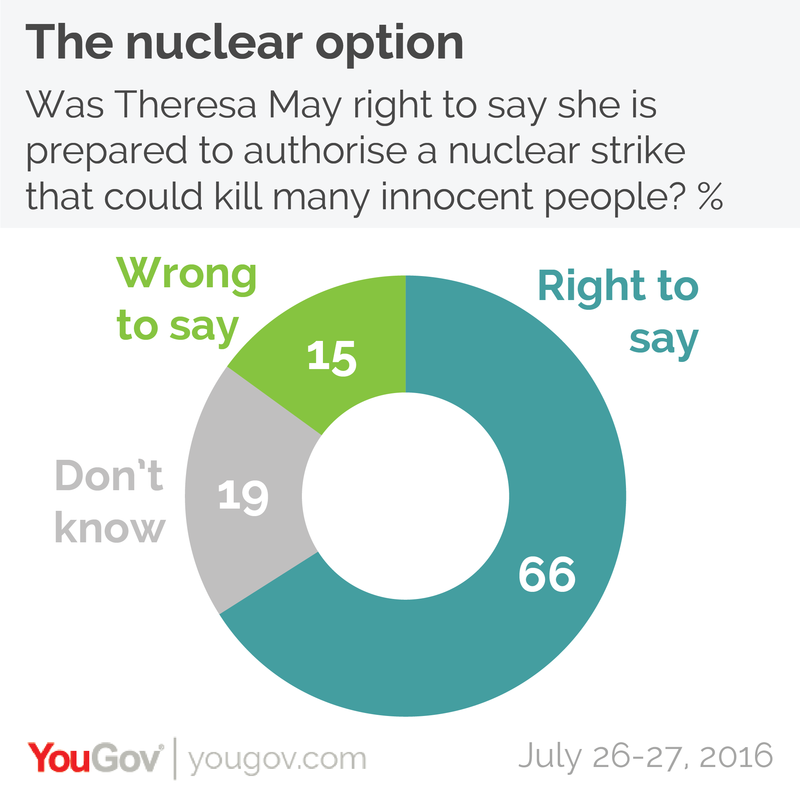 It seems that the public back Theresa May&apos;s stance, with two-thirds (66%) saying that they believe she was right to say she would be prepared to launch a strike. By comparison around a fifth (19%) think the was wrong. This number is actually higher than the proportion of people who support the UK having nuclear weapons (52%). This implies that there are many people who don’t want Britain to have nukes but subscribe to Theresa May’s position that if you do have the weapons you have to be seen to be prepared to use them. Likewise, should the UK come under a nuclear attack 60% of people would support launching a nuclear retaliation, with 21% saying they would not support it. Asked what they would do if they were a Prime Minister responsible for the decision to launch a retaliatory nuclear strike, these numbers barely change. Around six in ten (59%) state that they would launch a nuclear retaliation if they were sat in Downing Street and just under a quarter (23%) say they would not. The results come a week after 44% of people told YouGov they wanted to see Trident – Britain’s nuclear missile system – replaced. That research also showed that the public preferred to trust the Conservatives over Labour with decisions around Britain’s nuclear deterrence. Now a more detailed study of attitudes to Trident in Scotland – where the nuclear fleet is based – has shown that more Scots would prefer to scrap the UK’s nuclear missiles than replace them. 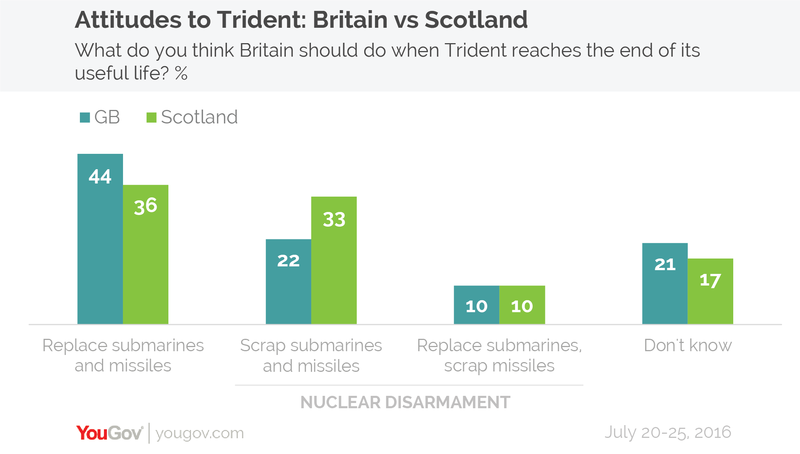 Over four in ten (43%) people in Scotland preferred to either stop arming Britain’s submarines with nuclear missiles or scrap the submarines and missiles altogether. This is compared to 36% who would want to introduce a new nuclear missile system.